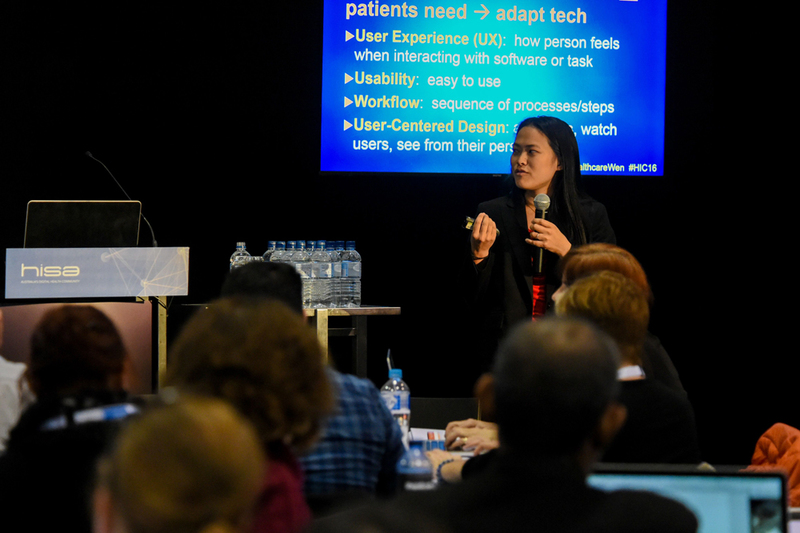 At HIC 2016, delegates contributed to an emerging Clinical Informatics agenda for Australia. Clinical Informatics is a sub-group within Health Informatics. Clinical informaticians assess the information needs of clinicians, managers and patients, and use these assessments to characterise, evaluate and improve clinical processes. Workshop convener, Dr Mark Santamaria, billed the event as the ‘inaugural meeting’ of HISA’s new Clinical Informatics community of practice (CoP), following a year of groundwork by the CoP committee. The keynote speaker, Dr Wen Dombrowski, advises US healthcare organisations and technology companies on: innovation, care models, data analytics, UX design and engagement. She drew on her extensive experience to identify the serious large-scale consequences of poorly designed IT systems and implementations, and flawed law and policymaking. She gave the example of the US 2009 HITECH Act (‘meaningful use’) where the government paid out billions to encourage EHR implementation, but without interoperability requirements. In doing so, it created thousands of separate silos needing costly workaround. She also cited the difficulties of creating diabetes reports because in the order-test results, process differences in coding lead to inappropriate analysis, with automation leading to thousands of errors. (1) When developing decision support systems, involve clinicians and patients from the beginning. Focus on the user experience: how users ‘feel’ as a result of interacting with the software. (2) At the set-up stage, recognise that interoperability is a ‘fundamental pre-requisite’, and that – along with data architecture – it needs strategic foresight. (3) Before finally choosing a vendor, know your organisation’s needs, do thorough due diligence on options, identify total cost of ownership, contractual obligations and payment contingencies. Following Dr Dombrowski’s talk, small workshop groups identified challenges and issues facing Clinical Informatics. The broad issues they identified were: education, standards, interoperability, silos, change management and project management. These issues will guide HISA’s growing Clinical Informatics Community of Practice. You can learn more about the Community of Practice here.